Living in the great state of Kentucky where there are so many horse farms I have to say I do believe they are the most beautiful animals God ever created. Their strength, their beauty as they run through the fields, the way their mane and tail fly with the wind – all show their magnificent beauty. 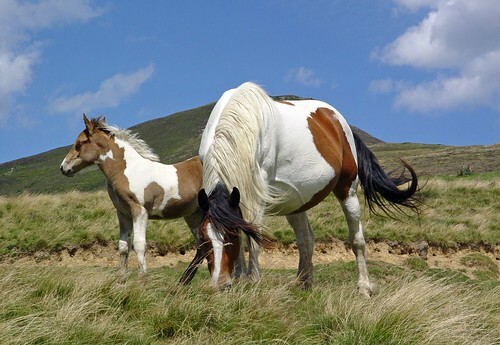 Wild horses, which are not found in Kentucky, are equally beautiful. There’s something completely breathtaking to watch a large herd of these animals roam the meadows and rest by the streams. These horses, in contrast to the tame horses of Kentucky, have a strong spirit within them. They are fierce, and may bite, kick, or even trample you if you get too close. The difference is in their life experiences. Where a tame horse has been broken slowly from birth by the owners’ insistence in feeding it by hand, saddling it, and riding it, a wild horse has none of those experiences. For it to become tame, a cowboy or rancher has to pursue the horse, and take it through great trials of its spirit to break it down and create in it a horse that can be trusted and used. Christians often have to go through these same types of trials. It may come in small doses, such as harsh words from friends or a short-term financial problem. These bring you closer to God because you realize anew your dependence upon him. As He brings you through them you realize He does care, and He is there to help you. The short-term little trials are endurable, one by one. This kind of growth is very much like something my Granddad use to tell me: if you pick up a calf every day from the day it was born until it becomes a cow, you’ll one day be able to actually pick up the cow. You grow, bit by bit, little by little, and in many situations, with very little hardship. But then there are those “other” trials. There are the trials that tear at your heart, that weigh on you like carrying an iron rod across your back. These are spirit breakers. They can break you down and cause you to crumble. They can leave you feeling far, far, away from God. You may become depressed, cry for days, feel like all hope is lost, and just wish you could sleep through life. James says to “consider it pure joy” when these occur because they test your faith. It’s through perseverance that our faith will grow. You can count it all joy! You can look at it as a blessing! The key to this is you have to look past it: past the pain, past the fear, past the heartbreak, past the hardship. Look toward the deliverance through faith. Even when the deliverance has not yet come, you can know based on past trials and His Holy Word that God will not forsake you. He is there, and He cares. He will bring you through it all as a victor if you will just reach out for His hand. Pray for strength, pray for mercy, pray for his guidance, and praise Him in the storm.